chunt denn au uf switch, ps4 usw. Han au eis bstellt.Freu mi,aber obs würkli nur no 2-3 Wuche goht?!? glaubs nöd. aber au iisi für mich.
Ha letschti es mail übercho das jetzt Beta started.Also wie vermueted wird das nix mit 2 Wuche.Behaupte chasch extrem froh si wenns vor Ende Johr söttsch ha. Egal. Warte au no es Jahr. Es isch ja nöd de Fonzi dehintr. Denke au ned das mer das Johr no met öppis setti rechne! Kraut Buster is our love letter to the NEOGEO and a fulfillment of the dream of making a World War 2 themed technicolor styled pixel art run'n'gun. It's art direction and designs were inspired by old war movies, Hogan's Heroes and Indy III. It's very useful against air enemies and bosses. Advanced players also can use it against enemies that are below. Rapid prison shank style stab move for bigger humanoid enemies like "Gas Gerd", "Lurchmutant", "Zwergritter", "Heisse Helga", "Herrin Peitsche", "Wein Werner", "Ueberritter Ausf. S" and "Ueberritter Ausf. G"
Maybe you can already guess from the above information that Kraut Buster plays purposefully quite different to the MS games. We used a more direct control approach known from the gorgeous Contra series. The player always has immediate control of the characters. There are no transition animations that get spooled off. Most actions are instant, like switching direction/jumping. Other are very fast like stabbing/ducking and grenade throwing. Those differences above and the 60 fps give Kraut Buster quite a different feel, especially in C-mode. However for people preferring the old and reduced controls of the MS games we offer a lot of customization options. Using the "old style" controls makes the game unnecessary more difficult though. The game requires 4 buttons per player 1L4B / 2L8B. T-mode is similar to the MS games. It's slower and more tactical. It's best played by slowly advancing and has lots of forced stops. Only a reduced set of missions need to be played to keep the game time below 40 minutes. Missions can be selected in the mission map screen. The 2nd mission for selection is always longer than the first. Ammunition is limited in this mode, but a bigger variety of weapons are available for pickup. C-mode is similar to the 90s Contra (III/HC) games. It's faster, brutal and relentless. You need to blast yourself through all missions in one go. There are no masks, no knives, no hidden treasures and no chicks. The game flow is less guided in this mode and you have more control over your own pace. This also means you need to do more enemy crowd control yourself as the engine can pump out quite a lot of enemies. There is a fast kill (quickkill) system in place that grants scoring bonuses. Bronze is the lowest but is still quite challenging. We recommend starting with that one to get acquainted with this game. Before you play the real game with the silver rank. The higher the rank the better the enemy AI gets, the more bullets and enemies will be there. Bigger enemies may have additional attacks and more energy. This game features a complex risk and reward based scoring system. To raise the combo meter destroy a lot of enemies in a short succession. Some enemies and some attacks give more boost than others. If your combo meter is very high you are in Baerzerker mode for maximum bonuses. Like on modern JAMMA hardware, settings and high scores are stored directly on the cartridge in an EEPROM. To access the settings hold the start button at booting (can be configured on MVS at soft DIPs). If you current weapon is empty, it switches to the other weapon slot. Activates weapon lock mode. It locks the weapon in aiming position. Allows the player to quickly turn the direction while jumping/shooting. We highly recommend to leave everything on and embrace the new play style. 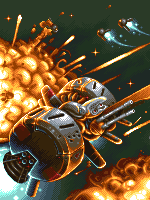 As Kraut Buster has a lot more sprites, multi layering techniques and at times background layers than similar games on NEOGEO, it has a higher risk of slowdown and sprite flicker. To keep sprite flicker and slowdown in check we introduced some simple 16 bit "AI" that decides on the fly to take measurements to reduce sprite flickering and slowdown. It's aggressiveness can be configured to some extend. Some examples are that dead bodies have a tendency to fall out of the game area or get otherwise disposed off ASAP. In favor of 60 fps we also needed to pass on having dynamic sprite depth sorting. This sometimes results in small sprite priority irregularities. As the NEOGEO hardware does not have sprite priority flags and with the huge amount of sprites we use, it would have been impossible to hold the 60fps goal otherwise. The game is optimized around the single player mode. The 2 player mode will increase anti flicker and slowdown measurements more aggressively. Forces 16 bit style 60hz flicker fake transparency on all explosions. This reduces risk of sprite flickering greatly. Works best on arcade and consumer CRTs due to their after glow. The game comes with a variety of built in cheat modes. Use at your own discretion. Score saving is disabled in that mode. The score font turns yellow as a cheat indicator. Unlimited credits are supported in home mode, you can add them with the select button. Like all our NEOGEO games Kraut Buster was developed for private home use. Make sure to read the included legal disclaimer and install on location at your own risk. As a small surprise Kraut Buster MVS kits come with a high quality mini marquee foil for the lightbox panel of your BigRed or MVS-U. To build and ship all units it takes about 2-3 weeks from now on. In the first 4-5 days we build and then ship the Shockbox LE and after that all normal MVS kits. The shop system will automatically send out emails and you can also log in the shop and see the current status of your orders there. Pictures of the Shockbox MVS LE can be found on our website and pictures of the MVS Kit in the shop. Once all MVS units are shipped we start working on the AES version of the 2.0 PCBs so they are ready when the software side is final too. This will take a couple of months. Thanks for staying with us over the years and letting us create our dream NEOGEO game! The Kraut Buster pixel artists finished their work on our first exclusive(?) Switch handheld game and already moved on to our next pixel art NEOGEO+arcade game. While Kraut Buster was made the render gfx team worked on a couple of Shmups, that will be revealed and released over the next 2 years. We also expect to expand the team further in the next year(s) and maybe add a new hardware platform to our portfolio. käufsch der es mvs consolized ? gopf, häds immer no käne becho?! 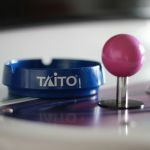 im schrollige http://www.neo-geo.com forum häds au no kei Sau becho, ond im www.nexgam.de forum au niemert!!! bitz komisch. m.o.terra kaesi hat geschrieben: gopf, häds immer no käne becho?! im schrollige http://www.neo-geo.com forum häds au no kei Sau becho, ond im http://www.nexgam.de forum au niemert!!! bitz komisch. hoffes nöd. hoffes wüki nöd. 90s arcade racer hät mer glanget. Fast Striker isch au 5 jahr gange und alli andere. vo dem her iisi. und xeno crisis klapped sicher au, will dete würklich d lüt de wiiter programmiere wänd. D Grafiker hät zB Flink uf em MD zeichnet. Damals bim N64 ha ich mini erschte schmerzhafte "erfahrige" gmacht kha... Rev Limit!!! viel meh als bim MD wirds nöd gäh. Xenocrysis isch nur wägeme Unfall verschobe gsi und es sind au chli besseri Lüüt dähinder, besser als de Grusigi Fonzie-transie.